Here at the Coastal Institute, we are fortunate enough to have some pretty incredible neighbors: Northern elephant seals! These majestic marine mammals are a pretty common site in central California as a handful of established rookeries are found along our beautiful coast. Elephant seal rookeries serve a number of purposes. These are where elephant seals mate, give birth, and even learn how to swim! Throughout the year the number of seals found at these rookeries varies but there are three peak times where the numbers are above average: late January, early May, and late October. 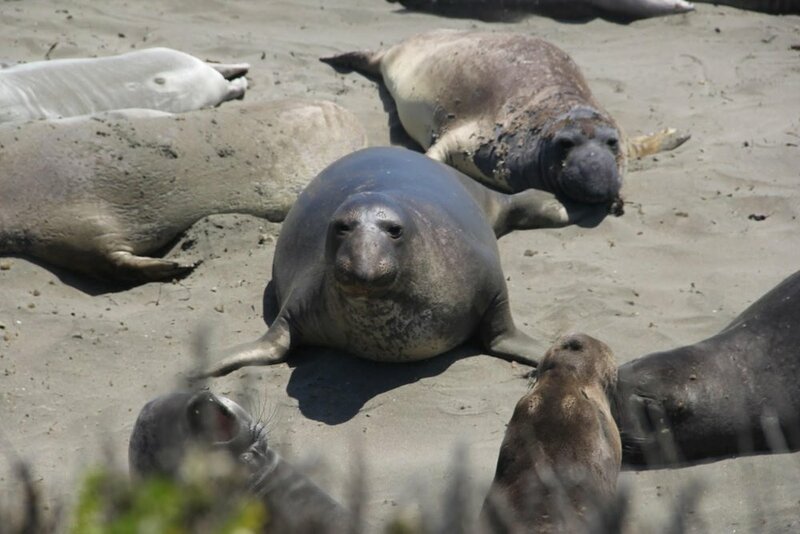 Late January is when the majority of elephant seal births occur, the first of May is when juvenile and female seals molt, while late October is when juvenile seal haul-out begins. For us humans, our year begins on January 1st. This isn't the case for elephant seals! Instead, their year, or cycle, begins in November when the first of the juvenile and younger males begin their haul-out of the ocean. The younger males always arrive first to have a little rest and relaxation before the larger and more dominant males arrive towards the end of the month. More mature males continue to arrive as November ends and starting in December, these bulls begin to fight for space on the beach. As December progresses, females begin to arrive and give birth towards the middle of the month. Once these females give birth they begin to breed with the most dominate males on the beach to ensure that they will have the strongest of offspring. Females continue to arrive and give birth in January as well wean their newborn pups. After weaning her pup for only 28 days, each mother will leave the beach. By February, the majority have given birth. Once March rolls around, the majority of adults have left the beach and all that remain are the weaned pups. Now that no adults rule the beaches, they are able to explore the beach as well as the shallow waters. Starting in April these, weaned pups begin to leave the beaches and head out to explore a whole new world…the open ocean! As these pups are leaving, the older juveniles as well the females return to molt their fur. Since the waters are warmer in the summer they no longer need as thick of a layer of fur to keep them nice and toasty. The first of May signifies the peak of this molting season and if you are lucky enough to visit the rookery during this time you may even see some fur flying around in the breeze! By the end of May all juveniles and females have finished their molt and return to the ocean. As we enter June, juvenile and adult males arrive to begin the molting process; this continues throughout July as well. By August all molting has finished and this is when we experience the fewest number of seals on the beach. Once September and October roll around, the beach population sky rockets as a significant amount of juveniles return to the rookery for the fall haul out. Moritsch, Marc. “Elephant Seals.” National Geographic, 10 May 2011, www.nationalgeographic.com/animals/mammals/group/elephant-seals/. Piedras Blancas Friends of the Elephant Seal | San Simeon, Cambria California, www.elephantseal.org/index.htm.